Normally, Excel displays the result of formula calculations. In this lesson, You will find a few ways on how you can display formulas in Excel. 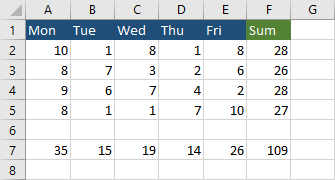 If you want to find out what formula is used in the selected cell, just click it and the formula will be displayed in the formula bar. When you work with formulas, sometimes they can become long and complicated. In such a case, a good way to deal with this problem is to place a single apostrophe in front of a formula. It will be treated as text, so even the broken formula can be fixed later. You can also use a bit different ways to keep a formula as text. For example, instead of using an apostrophe, you can delete the equal sign (=). If you have a more complicated example, you may want to see how formulas relate to each other. The following example shows a bunch of numbers that are summed inside a column and row. Of course, it’s not evident at just looking at the example. You can display formulas by choosing Formulas >> Formula Auditing >> Show Formulas. You can also use the following keyboard shortcut. 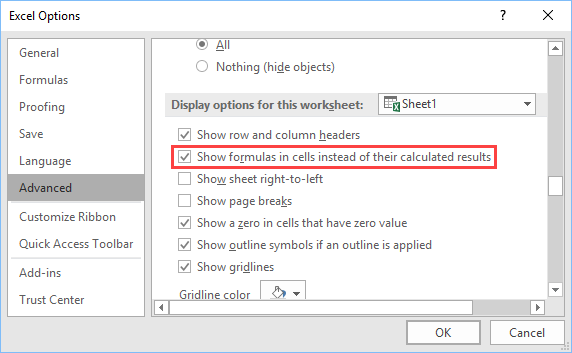 You can set this option for multiple worksheets by going to File >> Options >> Advanced >> Display options for this worksheet >> Show formulas in cells instead of their calculated results.